Women with urge predominant urinary incontinence received active intervention (drug therapy alone or combined with behavioral therapy) for 10 weeks, then stopped all therapy and were followed for 6 months more. In this planned secondary analysis, we aimed to identify predictors of therapeutic success at 10 weeks (≥70% reduction in incontinence) and of ability to discontinue treatment and sustain improvements 6 months later. Using data from 307 women, we performed logistic regression to identify predictors for outcomes described above. After controlling for group, only younger age was associated with short-term success (OR 0.8, 95% CI 0.66, 0.96). 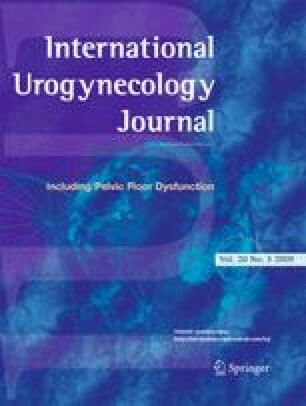 At 6 months, controlling for group and short-term outcome, only greater anterior vaginal wall prolapse was associated with successful discontinuation (POP-Q point Aa; OR 1.33, 95% CI 1.03, 1.7). These findings are not of sufficient strength to justify withholding conservative therapies but might be used to promote realistic expectations when counseling patients. Supported by cooperative agreements from the National Institute of Diabetes and Digestive and Kidney Diseases, U01 DK58225, U01 DK58229, U01 DK58234, U01 DK58231, U01 DK60379, U01 DK60380, U01 DK60393, U01 DK60395, U01 DK60397, and 60401; support was also provided by the National Institute of Child Health and Human Development and Office of Research in Women’s Health, National Institutes of Health. This trial is registered at Clinicaltrials.gov NCT00064662. For a list of UITN investigators, see Appendix 1. William Steers, MD, Chair (University of Virginia Charlottesville, VA); Ananias Diokno, MD, Veronica Mallett, MD (William Beaumont Hospital, Royal Oak, MI and Oakwood Hospital, Dearborn MI; U01 DK58231); Linda Brubaker, MD, MaryPat FitzGerald, MD, (Loyola University Medical Center, Maywood, IL; U01 DK60379); Holly E. Richter, PhD, MD, L. Keith Lloyd, MD, (University of Alabama, Birmingham, AL; U01 DK60380); Michael Albo, MD, Charles Nager, MD, (University of California, San Diego, CA; U01 DK60401); Toby C. Chai, MD, Harry W. Johnson, MD, (University of Maryland, Baltimore, MD; U01 DK60397); Halina M. Zyczynski, MD, Wendy Leng, MD (University of Pittsburgh, Pittsburgh, PA; U01 DK 58225); Philippe Zimmern, MD, Gary Lemack, MD (University of Texas Southwestern, Dallas, TX; U01 DK60395); Stephen Kraus, MD, Thomas Rozanski, MD (University of Texas Health Sciences Center, San Antonio, TX; U01 DK58234); Peggy Norton, MD, David Lesser, MD; (University of Utah, Salt Lake City, UT; U01 DK60393); Sharon Tennstedt, PhD, Anne Stoddard, ScD (New England Research Institutes, Watertown, MA; U01 DK58229); Debuene Chang, MD, John W. Kusek, PhD, Leroy M. Nyberg, MD, PhD (National Institute of Diabetes and Digestive and Kidney Diseases); Anne M. Weber, MD (National Institute of Child Health and Human Development). Rowell S. Ashford II, MD; Jan Baker, APRN; Diane Borello-France, PT, PhD; Kathryn L. Burgio, PhD; Seine Chiang, MD; Ash Dabbous, MD; Patricia S. Goode, MD; Lee N. Hammontree, MD; Kimberly Kenton, MD; Salil Khandwala, MD; Karl Luber, MD; Emily Lukacz, MD; Shawn Menefee, MD; Pamela Moalli, MD; Kenneth Peters, MD; Elizabeth Sagan, MD; Joseph Schaffer, MD; Amanda Simsiman, MD; Larry Sirls, MD; Robert Starr, MD; R. Edward Varner, MD. Rosemary Bradt, RNC; Karen Debes, RN; Rosanna Dinh, RN, CCRC; Judy Gruss, RN; Lynn Hall, RN, MSN, CURN; Alice Howell, RN, BSN, CCRC; Kathy Jesse, RN; D. Lynn Kalinoski, PhD; Kathryn Koches, RN; Barbara Leemon, RN; Karen Mislanovich, RN; Shelly O’Meara, RN; Janese Parent, RN; Norma Pope, RN; Caren Prather, RN; Terry Rogers, RN; Sylvia Sluder, CCRP; Mary Tulke, RN. Kimberly J. Dandreo, MSc; Corinne J. Leifer, BA; Susan M. McDermott, MPH, GNP; Anne Stoddard, ScD (Co-PI); Sharon Tennstedt, PhD (PI); Liane Tinsley, MPH; Lisa Wruck, ScD; Yan Xu, MS.
Elizabeth A.Gormley MD (Chair), Dartmouth-Hitchcock Medical Center, Lebanon NH; Paul Abrams MD, Bristol Urological Institute, Bristol UK; Diedre Bland MD, Blue Ridge Medical Associates, Winston Salem NC; J. Quentin Clemens MD, Northwestern University Medical School, Chicago IL; John Connett PhD, University of Minnesota, Minneapolis MN; William Henderson PhD, University of Colorado, Aurora CO; Dee Fenner MD, University of Michigan, Ann Arbor MI; Sheryl Kelsey PhD, University of Pittsburgh, Pittsburgh PA; Deborah Myers MD, Brown University School of Medicine, Providence RI; Jacek Mostwin MD, Johns Hopkins Hospital, Baltimore MD; Bassem Wadie MBBCh, MSc, MD, Mansoura Urology; and Nephrology Center, Mansoura, Egypt.